a few years ago I took a variety of mustard starts from a friend called “Red Giant”–dark leaves, spicy taste, and they have been volunteering like mad all over my garden since then. They have just all gone to seed after weeks of eating mustard greens, but this looks like a delicious way to serve them, and sort of reminds me of an Italian omni dish my Mom used to make–sausage and endives. .a little fennel might be nice in this dish, too, along with the peppery greens. My neighbor still has another variety of mustard in his salad mix patch, so maybe I’ll pilfer some of his and try this! I definitely will make it sometime! Amen! Totally agree. We just need a healthy dose of hunger, curiosity, courage to try the new, and a drive we don’t wish to make!☺ Voila! A new dish is born! Yum! I made this today for lunch, using leftover bok choy as Josiane mentioned. I used white wine vinegar and sweet onion instead as well, based on what I had in stock. I put it over a bed of couscous and it was quite yummy! This looks wonderful! Can't wait to try it! This is one of my favorite FFV recipes. It is fast, DELICIOUS, and easy to make. We had it last night for the 2nd time, and it was so, so good. I put the mix over pasta for my husband, and he was crazy about it. We also had some roasted brussel sprouts on the side. This is definitely going to be one of my quick and easy "go-to" meals. I made this last night and served it with mashed sweet potatoes. 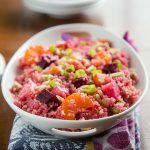 My family and I loved it and I highly recommend this recipe! Wednesday this week is a crock-pot day… I'm going to try this with canned (i know, canned ain't quite right) chickpeas and collards in the slow cooker for the afternoon and hope there's enough liquid in the recipe to keep it stewing till J gets home from evening class. couldn't find mustard greens, and this will be our first time trying collards- hope it works! thanks for the recipes! 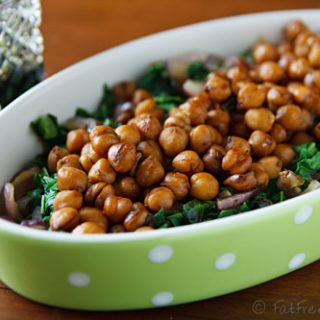 I made this for the second time tonight, subbing white beans for the chick peas. Delicious again! So quick, simple and the entire house smells lucious! I am going to try it over sweet potatoe, as one of the other commenters suggested. That sounds wonderful. Thank you for being so creative! I made this for lunch today (my first time cooking mustard greens). I thought it was tasty but the greens were pretty tough and required a lot of chewing. Is this normal for them or did I do something wrong? Sorry that yours came out so tough! I think that it varies by the age of the greens. Younger ones are more tender, but more mature, larger leaves are tougher and take longer to cook. Thanks for the tip! I’ll cook them longer (or taste them along the way) next time. I’ll still eat the leftovers! 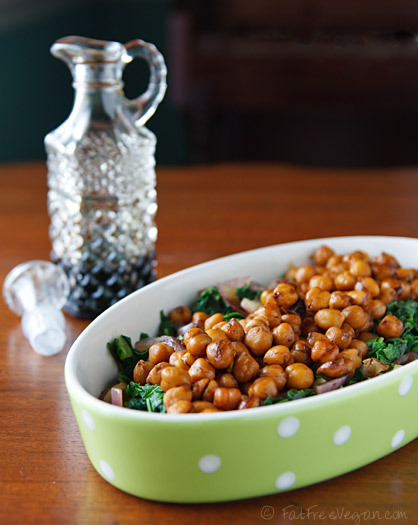 Balsamic glazed chick peas and mustard greens are absolutely awesome. 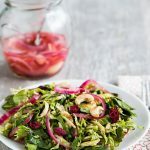 I love new recipes using greens without the meat of fatback, bacon or hog jaw and the seasons are perfect as directed. Thanks!! I made this today for my lunch after realizing that my food choices for the last week were sorely lacking. I ate the whole thing by myself and Oh My! I thought the mustard greens would still have that bitter bite to them, but they were so smooth & tasty. I am in love. It was just the right amount of balsamic flavor, and I used low-sodium soy sauce to keep the salt from overwhelming the dish. I found your recipe on Pinterest and made it this week. I wrote about it on my on blog today. The only thing I changed was to add a spritz of lemon to finish. I like the variations the others have suggested and will try them with my own crop of mustard greens soon. I tried this recipe tonight having found Mustard Greens at the Farmer’s Market — and it was spectacular. 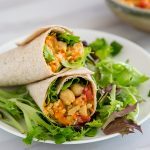 I love the greens being prepared separately, as not to over-cook them, and the glazed chickpeas were an excellent complement (I mixed the red pepper flakes and garlic with the other sauce elements which worked out very well). 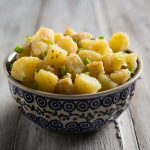 This quick & easy dish will definitely be back at my table in the future! Simply amazing! Thanks for the great recipes, Susan! You are making my switch to E2L so much easier! 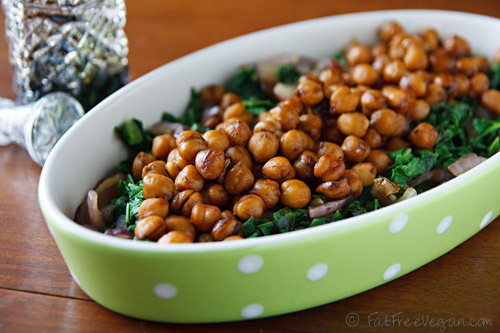 I made the chickpeas/mustard greens with balsamic vinegar last night and they were delicious! Thanks! I’d been wondering what to do with my mustard greens. This was so good! Thank you! I don’t use sugar or agave, would maple syrup work as a substitute? Yes, virtually any type of sugar will work, or you could probably leave it out since it’s such a tiny amount. I loved this recipe. What’s even better is my family loved it. I’ve never cooked mustard greens before so I wasn’t quite sure what to do with them. I was also uncertain about the veggie broth instead of oil but it was fabulous and no FAT! Just made this recipe today, though I did substitute collards for the mustard greens since that’s what I had on hand. Other than the greens, didn’t change a thing. And I’m making it again tomorrow! It’s that good.